Vegetable biryani, Learn how to make vegetable biryani. 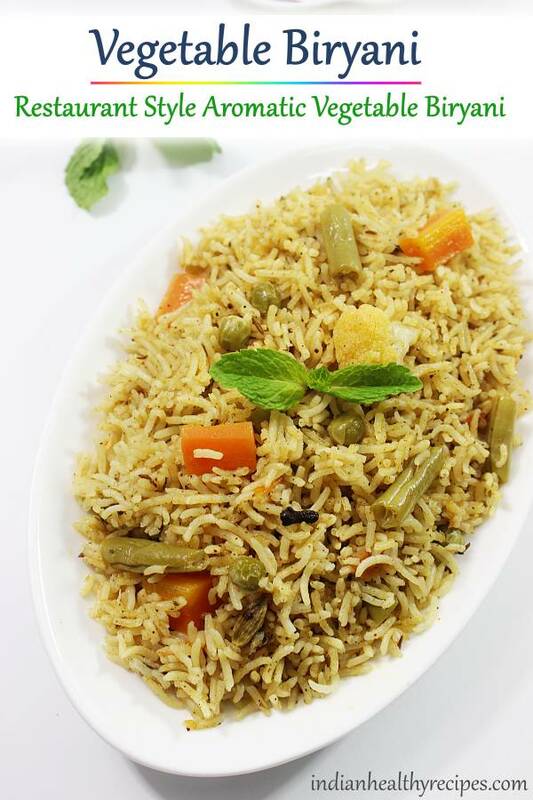 Most restaurants serve vegetable biryani that is not dum cooked since it is not economical to make it in large quantities. So they come up with so many quick versions of serving biryani to the customers. This is at least true in South India and even in Singapore especially when it is vegetable biryani. 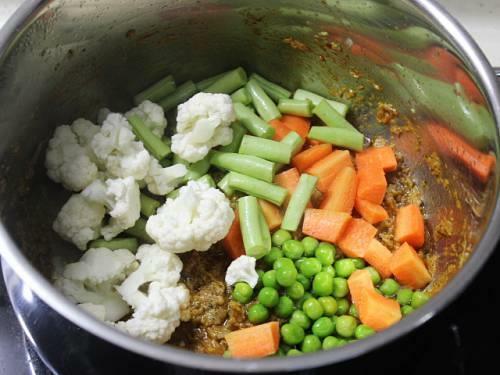 The most common method used is to make a very good vegetable gravy in bulk and cook the basmati rice in bulk. When ever they get orders, they either layer or mix the vegetable gravy with the al dente cooked rice and serve. There is no dum process involved yet they taste great and very aromatic. This is one such easy recipe, that is very flavorful and tasty. 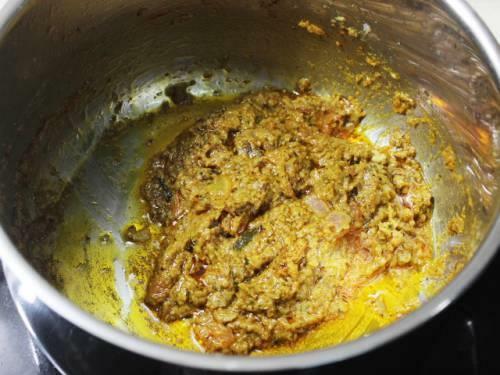 It includes fresh ground masala paste and masala powder. I have posted several vegetable biryani recipes on this blog each with their own specialty. But this recipe is a keeper for its simplicity, great taste and amazing aroma. is easy & a good one for beginners. But if you are particular about the dum cooked biryani, then you may go ahead and make this Hyderabadi veg dum biryani. 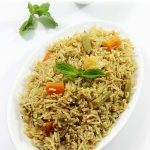 You can also check this Veg biryani in pressure cooker recipe which is super quick to make. can be prepared in a pot or pressure cooker or instant pot. It can also be dum cooked without layering. It has special flavors & is a light biryani that is not pungent or too spicy. The unique flavors comes from the onion mint coriander paste and homemade instant biryani masala powder. If you have any other biryani masala powder in hand you can use it. Biryani gets its taste and flavors from the biryani masala we use, so choose a good one. 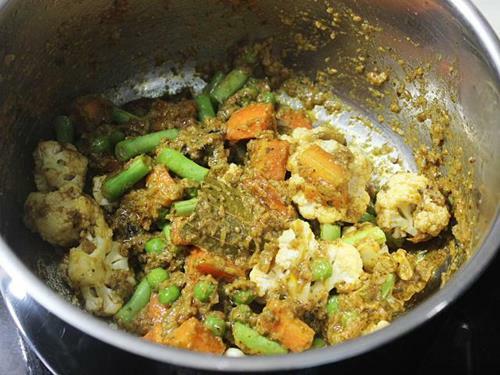 This Vegetable biryani can be made with plain water, coconut milk or vegetable stock. 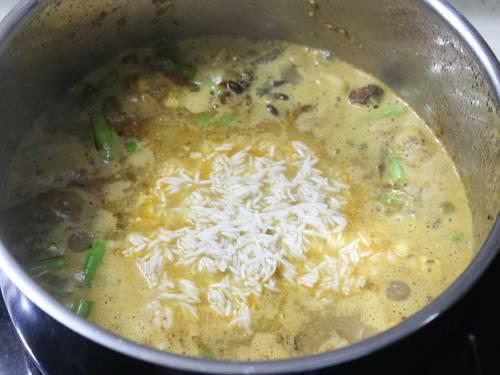 Just use coconut milk or vegetable stock instead of plain water to cook the biryani. You may like to check this collection of Biryani recipes. 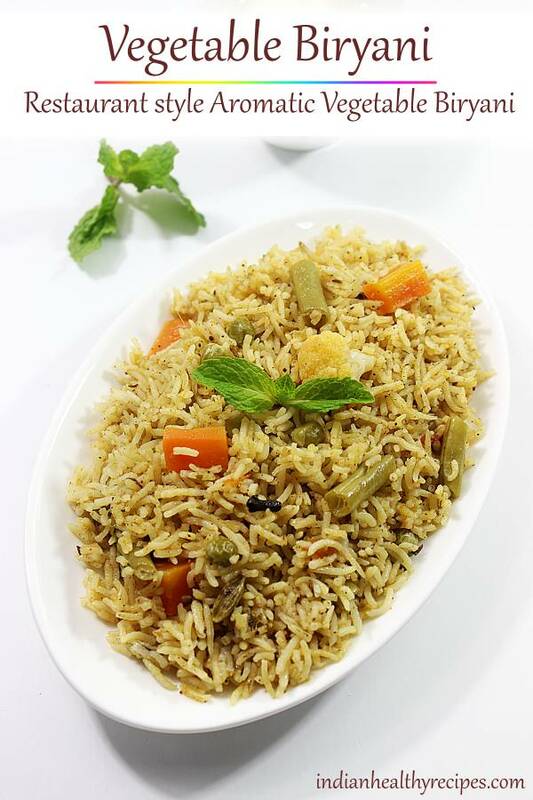 Restaurant style vegetable biryani made with fragrant basmati rice, yogurt, spices & mixed vegetables. 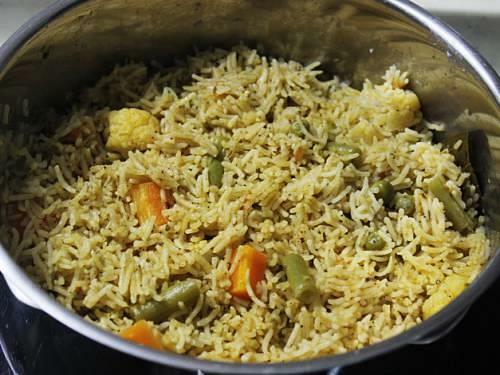 This recipe will give you one of the best vegetable biryani. Soak rice for at least 20 mins. Wash vegetables under running water. Drain the water chop them to bite sized pieces. Chop tomatoes, slice onions, and slit chili. Keep them aside for later use. Wash mint and coriander leaves in lot of water. Set them to drain. Powder all the ingredients mentioned under “To powder” in a blender. Make a fine powder. Keep it aside. Add green chilies, onions, mint, coriander leaves, ginger and garlic to a blender jar. Then make a fine paste. Drain the soaked rice in a colander. Ensure there is no water left in the rice. Add tomatoes, yogurt, red chili powder, turmeric and salt. Cook or fry till the tomatoes turn soft. If needed cover the pan and cook till the tomatoes soft. Fry till the oil begins to leave the sides of the pan. Next pour water and adjust salt. Check the salt, the water must be slightly salty. Bring it to a rapid boil, not just hot. Add rice to the boiling water. Then cook till very little water is left. Stir occasionally. At this stage the rice is under cooked or 3/4 cooked. Drizzle the rose water or kewra water. Cover the pot with a tight lid. Cook on a low flame till rice is fully cooked. Stir everything well. Cover. Then switch off the stove and keep covered. Do not open the lid for at least 15 to 20 minutes. Place the boiling rice pot on a hot tawa and then cook for about 10 minutes. Turn off the stove and leave it on the tawa for some more time. 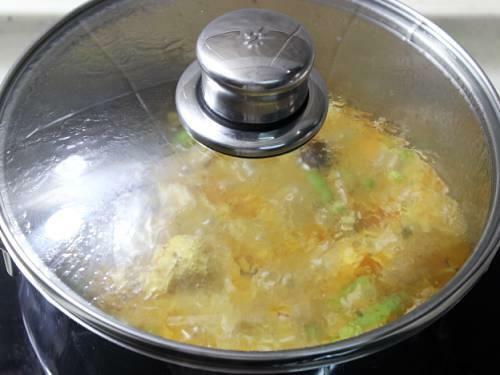 Close the pressure cooker lid and cook for about 5 minutes on a low flame. Do not let the cooker whistle. Off the stove. Fluff up the rice after 20 minutes. You can serve this veg biryani with a raita and biryani gravy. 1. Wash rice and soak for 20 minutes. Drain off in a colander. Set this aside. 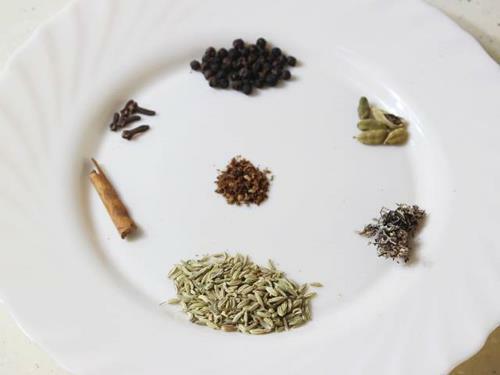 These are the spices to powder. Powder finely and keep this aside. 2. 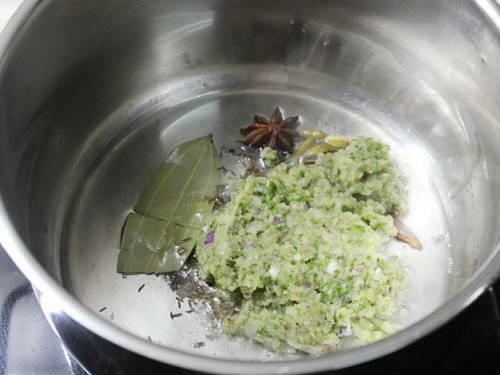 Make a fine paste of ginger, garlic, mint, coriander and onion. Set this aside. Powder the spices mentioned under to powder. 3. Heat the pot with oil, add spices and fry till they begin to sizzle. 4. 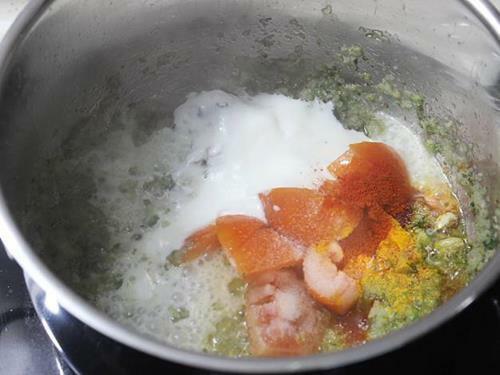 Add the green paste from step 2 and fry for about 3 to 4 minutes. The raw smell has to go away. 5. Next add in the yogurt, salt, tomatoes, chili powder and turmeric. Cook till the tomatoes turn mushy. I had to cover and cook on a medium flame to prevent burning. 6. The oil begins to separate from the mix. 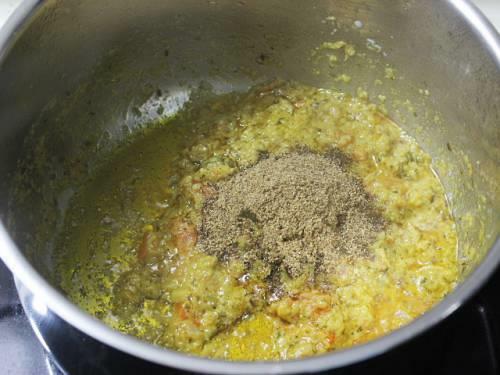 Then add the powder and fry again. 7. Since I used raw spices to make the powder, i fried the masala well till it turned fragrant. Do not burn it. 8. Add chopped veggies and mix well. 8. Next fry for another 3 to 4 minutes. 9. Lastly pour 3 1/2 cups water and little salt. we already added salt to cook tomatoes, so add little. Taste the water. It has to be slightly salty. Bring the water to a rapid boil. 10. Soaked rice should be drained well, with no water left. After draining add it to the boiling water. Cook till there is very little water left, as you see in this picture. Add kewra or rose water. 11. Cover it with a tight lid. Then simmer the stove and cook till the rice is done. For the dum process: Transfer the biryani pot over a hot tawa. Cook for exactly 10 mins on a medium flame. Stir well when it is cooked and cover the lid and off the stove. Leave the rice undisturbed for about 15 to 20 minutes. veg biryani is ready to serve. If you desire, you can add a tbsp ghee on top and fluff up the rice. A simple onion or cucumber raita goes well as a side dish to this veg biryani. 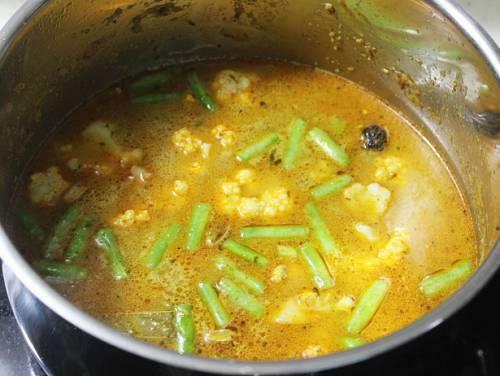 You can even accompany this with capsicum salan, veg shorba, potato kurma or mushroom kurma. Thanks for trying the recipe. Happy to know it turned out good. I have never made biryani for 150 people. Sorry could not help you. Thank you for this recipe! I tried making biryani before which did not turn out, but your recipe was very easy to follow and was delicious. I’ll be trying more recipes from your site… cheers! Thanks for trying. Glad to know you liked it. Awesome recipe. Thanks for posting. Could you please let me know what brand of pot you have used to cook the biryani in. I am hunting for a thick bottomed one with a glass lid. Will try your recipe as soon as i buy one. Thanks in advance for your reply. I have used a WMF heavy bottom pot bought in Singapore. I also use butterfly steel pressure cooker to make biryani. Without using the cooker lid I use a glass lid that fits the cooker. Glass lids are available separately in all sizes, with and without a vent. You can match these lids with different pots, pressure cookers and even pans. I guess you can also find all these online. Hi Swasthi, is all your measurements based on the rice cup (that comes with the electric cookers) or is it based on the standard cup size in US? It is a 240 ml cup , same as Us cup size. It is mentioned in the recipe card. Glad to know your family liked it. Great dish… Thanks for giving such a yummy dish. I made this today… Very tasty. Thank u so much. Whenever I make bisibelebath I get good compliments. Thanks to you. Happy to know you liked it. Glad it turned out good. Hum bachelor ke liye bhut tuf hai ye sab karna. Now print is enabled for recipe card, hope it helps. I had always used store made biryani masala before and the biriyani was always a disaster. 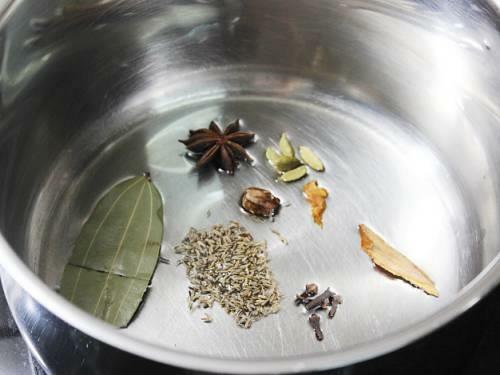 Luckily I tried this recipe after seeing the multiple positive feedback…aroma was heavenly and taste divine.. This was the best recipe to follow and every bit of the biriyani was yummy!!! All ingredients worked liked magic. I enjoyed cooking ! Thank you!! I shared the link to all who ate. so glad to know veg biryani turned out good. Thanks a lot for trying and sharing the link as well. Happy to know you have been following the recipes. Thanks for trying and sharing the outcome. Have a good day!!! For fun biriyani shall I cook in stew pot? It has a steam hole in the glass lid? Will the pot cook dum biriyani? You can use a lid with hole. I have done it before. I would put a green chili in the hole to stop the steam come out. Just to check if the biryani is done, I would remove the chili and check if the steam comes out.